Town Portal on the interface. 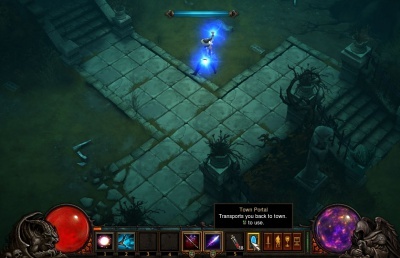 The Town Portal returns in Diablo 3 (after numerous changes during development), with a slightly different function than it had in previous games. The portal is now cast directly from a button on the belt interface; no scrolls or other reagents are required. There is no longer a portal cast in the dungeon; the character is transported directly to town, after a five second casting delay. If the character moves, casts another spell, or is damaged by attack during that time, the casting animation is cancelled; these features are designed to keep players from using Town Portal as an easy escape from danger. The familiar blue Town Portal only appears in town, and players can run into their own portal (but not one from another player) to return directly to the spot they departed from. Town Portals are no longer required to move from town to the location of other players in the dungeon, since the in-game Banner system fills that function. Town Portals were out of the game for some time during development, and only returned in Beta Patch 10 in January 2012. See the Stone of Recall article for details about the pre-TP system. The Stone of Recall tooltip. Town Portals are gone. We found them to be a crippling combat exploit. We found that while they had some cooperative uses, they tended to split players up a lot. As soon as players wanted to go back to town they did, and then they had to figure out how to get back to their party. We don’t want players to ever be split up. But the big thing is that Town Portals were a combat exploit. When players can essentially portal out of any situation, it makes it almost impossible for the designers to create a game that’s challenging and compelling, or a world that you’re really immersed in. To replace the need for town portals we’ve added salvaging and we have a couple of other systems that we haven’t shown yet that help with that. The goal is for you to not really miss them. For a time, players could only return to town via Waypoints. To ameliorate that travel difficulty, the designers introduced various features including NPC merchants located in the dungeons, as well as the Scroll of Wealth (which evolved into the Cauldron of Jordan) to allow instant item selling from anywhere, as well as the Nephalem Cube to facilitate salvaging of items from the dungeon. We’ve put in several things to offset the lack of Town Portals. The most obvious are more frequent Waypoints. These give players more opportunities to return to go back to town. We’ve also added salvaging to let players break items down into small parts that stack up in your inventory. We’ve also added a Scroll of Wealth that allows you to sell items right on location. We’ve always been trying to see if we can create a better system than town portals, making waypoints the main travel back to town mechanic. But, it’s looking like it’s just simply more fun and a quality-of-life-nicety to be able to jump back to town from anywhere even if waypoints are all over the place. Plus it’s not really that hard to avoid the few pitfalls that TPs in Diablo II had. A Wizard returning to Tristram. The new system was called the Stone of Recall, and its function was identical to the town portal system now in the game. A character clicked on their Stone of Recall and went into a casting animation. If they were uninterrupted by a monster or by moving or casting a spell, they would warp directly to town after about five seconds. Unlike the Diablo 1 and Diablo 2 system, there was no blue portal created in the dungeon; characters were simply warped directly to town. In town a blue portal appeared, which would take the player back to the exact spot from which they'd departed, if they passed through it. This system seemed to be the final design, until in early 2012 the developers revealed that the Stone of Recall, along with the Nephalem Cube and Cauldron of Jordan had all been removed from the game. 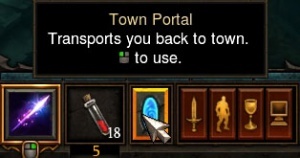 The Stone of Recall changed the least, as a Town Portal icon, with an identical function to the Stone of Recall, was added to the belt interface. There were numerous red portals in Diablo II, to take players between distant locations that weren't appropriate for Waypoint travel. There were also town portals cast by NPCs that players could not use, such as those the rescued Barbarian NPCs cast in Act Five. 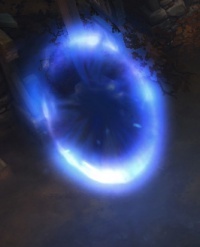 These types of portals do not seem to be a feature in Diablo III, other than the ones players see in town, after returning via a town portal. 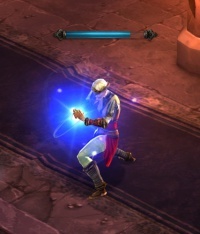 Players can not cast blue portals in the dungeons for other players to use, and while the Barbarian cast such a portal for the use of Deckard Cain in the first gameplay movie, released with the June 2008 Diablo III announcement, that feature/function was evolved away from over the course of development. Blue portal seen in Tristram. The Town Portal spell seems to be closely related to the Horadric Waypoint network, and work with similar magical components to the Teleport spell, however, it does not seem to require the same type of physical component as the runed stone of a Waypoint. The Brotherhood constructed numerous magical gateways between their mighty fortresses and settlements so that they could quickly concentrate their defences against any incursion by the Demons. With but a thought, the Crusaders of the Light could transport themselves to predetermined destinations many leagues apart. It could also be a completely different set of teleportation nodes, besides the actual Waypoint network, made specifically for retreating back to the nearest safe place, and nothing else. Although the secret of creating these gateways as well as the Waypoints has been long lost, it is still possible to use the pathways that are already in place. A Portal opened by means of this spell will always take the caster to the location of the nearest gate and remain open long enough to bring the caster back to his point of origin. The Tristram Cathedral is built upon the remains of a Horadrim monastery, and has at least in the past harbored a portal gateway nearby. This page was last edited on 13 May 2012, at 14:29.